Much to the surprise of no one, Discussion Davis and Miles Manhoef once again went a full sixty minutes in their heavily-anticipated rematch. Of course, it was not without incident. Shenanigans, if you will. Both the Alt-Right and the Shadow Realm had their presence felt in the main event, as Federal Bell was sent down to attack Miles Manhoef and DISGRACED (Freddy Fischer’s emo Shadow Realm name) came down to cause further chaos. Many will read into these matters, but truth-be-told, it felt less about allegiances and alliances as it did sowing chaos. 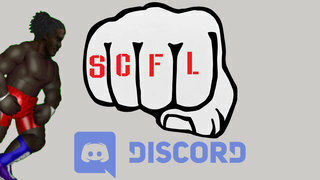 Ichabod Adams declared himself the SCFL Pro World Championship holder after last week’s debocle, with the idea for Miles Manhoef vs. 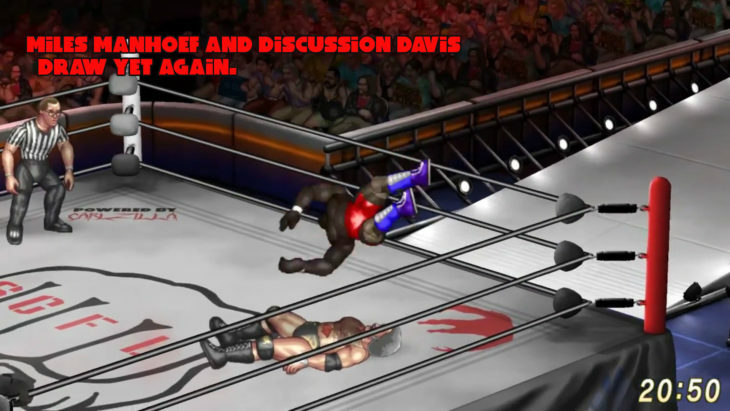 Discussion Davis II being for contendership to his title, yet he doesn’t really have a title. The title was left in the International Foods aisle at the local Hy-Vee market by then-champion Let Liu (as “Freddy Fischer”). Truth-be-told, absolutely nobody understands what is going on with the championship, but we do know that throughout the night the Alt-Right messed with Discussion Davis, who they clearly saw as having the upper-hand in a second battle against a perennially-injured Manhoef. They did so by injuring Picaporte Rodriguez and Sledding Bianchi, the other two referees, forcing Discussion to referee every bout, excluding his own, where Ron Harris ever-so-gracefully came down to plod around and slowly count each pinfall attempt. It was really sort of pathetic. It was clear that the Alt-Right, Ichabod Adams in particular, was not looking for a clear winner to arise from this scenario. Ichabod got his wish and nobody won. Now there are multiple men with claims towards a seemingly-vacant championship. Who even knows anymore? What we do know is that Miles Manhoef, or at least the awoken spirit of Miles Manhoef, was flying across the screen multiple times throughout the show, without explanation. That was far from the only strange happening on this show, either, as during Front Reed vs. Gordon Garabaldi the Shadow Realm-ified Fragrant Tanaka made his way to the ring and was involved in one of the craziest throws that we’ve ever seen in all of SCFL history. The COPS continued to pursue questioning of Team Belly Ribbon in a four-on-four elimination tag match that saw an already-injured Sledding Bianchi still compete, but get annihilated. This led to Officer Nate and his boys having a clear advantage, made only worse by Immediately Ito being knocked out in the middle of the ring. Boxing Bianchi and Especially Esposito fought hard, but were unable to beat the odds with the Cops making a clean sweep, although gathering zero information in the process. Speaking of Esposito, while he’s already a clear contender for Wim Nijman’s SCFL Pro US Championship, there was a triple threat to determine who else deserves a shot and Chuckie Murphy — just returning from a concussion — suffered yet another concussion, this time at the hands of Spencer Morgan. Morgan was being decimated by Murphy and Computer Collins, only for Spencer to hit a neckbreaker on Chuckie with him landing hard on the back of his head, suffering yet another concussion. You can check out the full replay above.